To add a touch of Halloween, you’ll need a foam wreath, muslin, and canvas fabric in white, orange, and red (or, if you want to go traditional, white, orange, and yellow). Wrap the foam wreath in pieces of muslin and secure with straight pins, Then, cut your fabric into squares. Fold each square in half, then in half again and use a straight pin to pin it to the wreath. Repeat with as many squares as you desire (the more, the fuller the wreath). 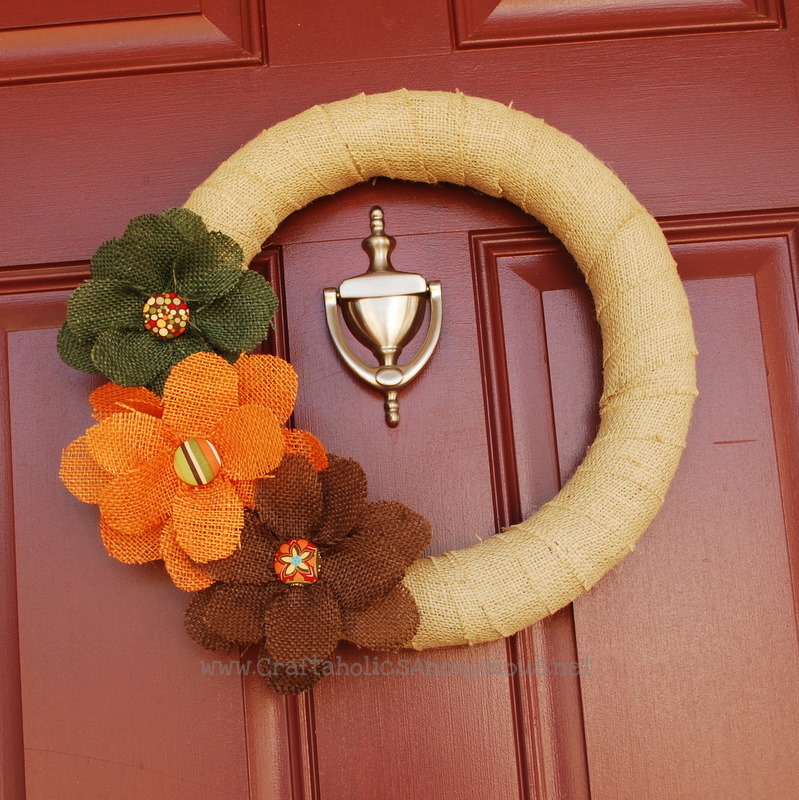 This wreath not only epitomizes fall, but it also looks harder to do than it is. You’ll need a foam wreath (preferably a dark color, but you can always paint it if you want), a hot glue gun, and pinecones separated into three sizes (small, medium, and large). Glue each pinecone to the wreath in a pattern. We suggest putting the smallest on the inside and the largest on the outside, but it’s up to you. 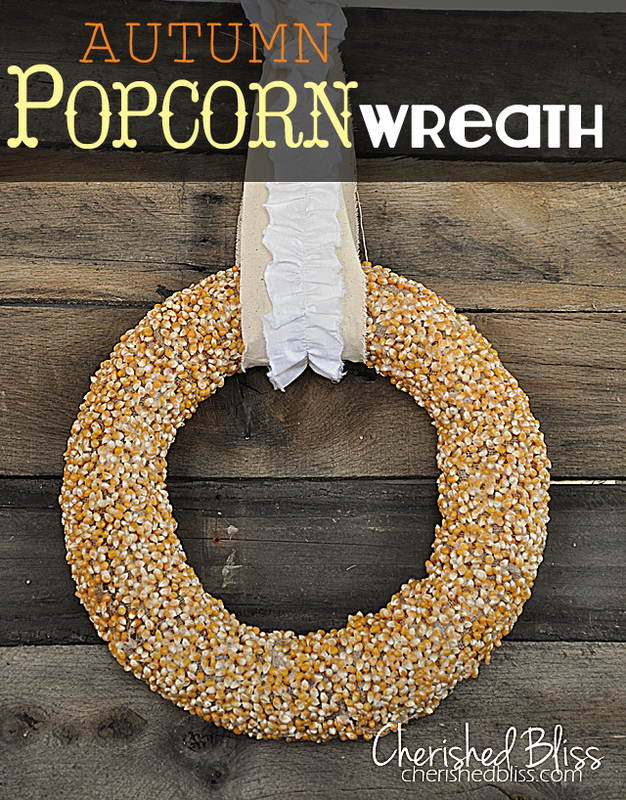 For this popcorn kernel wreath, start with a foam wreath and wrap it in pieces of burlap. You can either use straight pins to pin the pieces or you can glue the burlap on. After that, paint sections of your wreath with Mod Podge and sprinkle popcorn kernels on top. Once it dries, repeat the process, then move onto the next section. Once you’re done you can use a ribbon or piece of burlap to hang it. Burlap is a warm, festive fabric for the fall, and you can use it to make this pretty wrapped wreath. 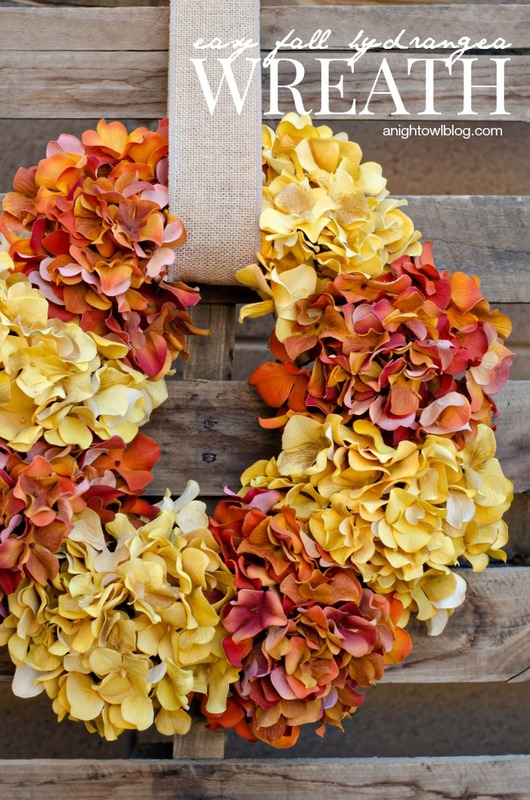 Simply use a hot glue gun to wrap colored burlap around a foam wreath. Then, for the flowers, cut different colored burlap into small, medium, and large “bow tie” shapes. Stack the shapes from large to small, alternating angles and pin together using fabric-covered metal buttons. Then, glue or pin your flowers to your wreath. For something a little more unique, gather wheat pieces (in any color you’d like), a cardboard box, some muslin or burlap, and a hot glue gun. Cut a wreath shape from the cardboard box and wrap it with muslin or burlap. Then, glue individual pieces of wheat to the wreath base and repeat with a second layer for depth. For a finishing touch, you can add ribbon or wheat in a contrasting color. 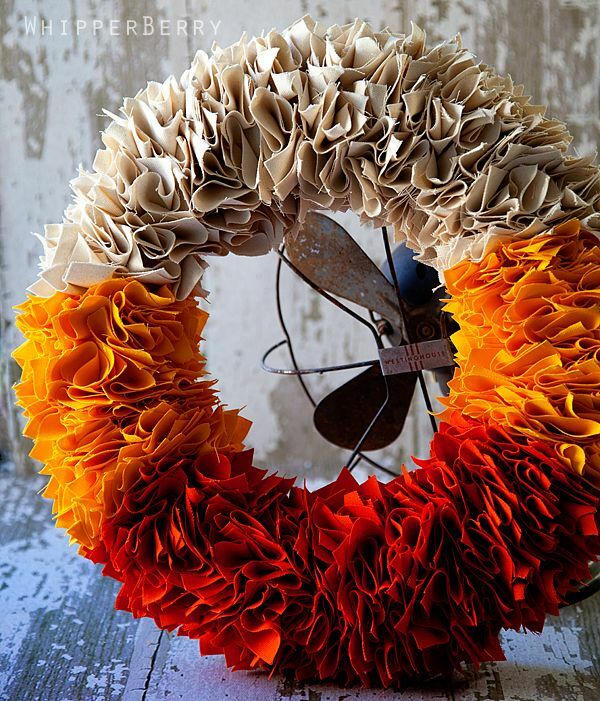 Even though this wreath doesn’t have traditional fall colors, it makes a fall statement. You’ll need a foam wreath, twine, a base fabric, and swatches of complementary fabric for the pumpkins. 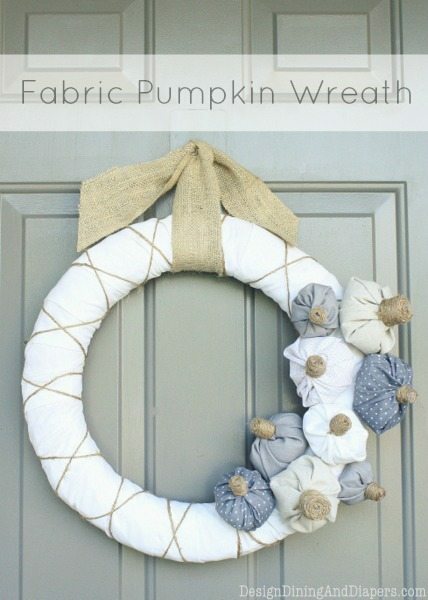 Wrap the wreath with your base fabric using glue or straight pins to attach. Then, criss-cross twine around the wreath for an accent. To make the pumpkins, stuff your fabric squares with pillow stuffing and glue together at the top. Add “stems” by wrapping twine around corks or thimbles, then attach your pumpkins to your wreath. For a touch of flowers, make this easy hydrangea wreath. Simply drill holes in a floral craft wreath and string through stems of faux fall-colored hydrangea flowers. Bend the stems on the back side of the wreath to keep them in place (and so your wreath sits flat). After that, attach a piece of burlap and hang. If you make any of these wreaths (or have a fall wreath of your own), we’d love to see it – post your photo to our Facebook page! This entry was posted in DIY and tagged crafts, fall.